Can you conquer the entire Mediterranean? 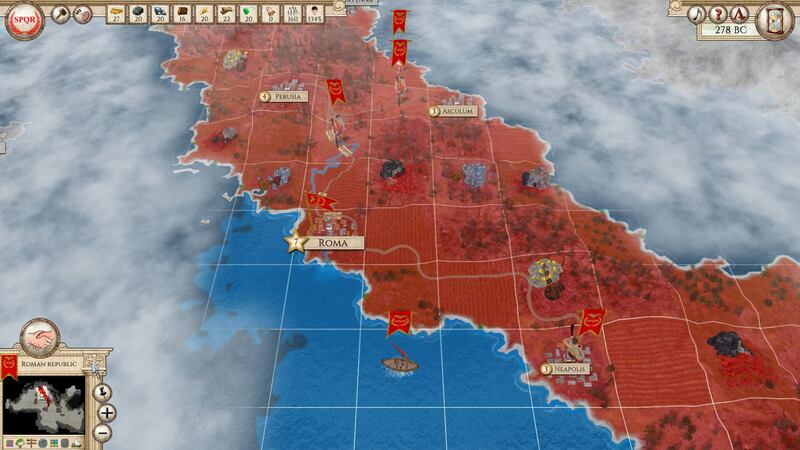 It has been my pleasure to review Kubat Software and Slitherine’s latest, tremendous 4X: Aggressors: Ancient Rome. It’s a turn-based strategy 4X which is both extremely deep and exceedingly approachable. There’s a sophistication level here that is well above most of the genre. There’s way too much going on and under the hood for me to remotely come close to covering everything. I’ll do my best to hit as many highlights as possible though. I’ll also be intentionally vague at points to not spoil anything. Getting started is easy enough. Either choose ‘Ancient Mediterranean’ or Customized World’. The Ancient Mediterranean option allows you to choose one of twenty possible countries. 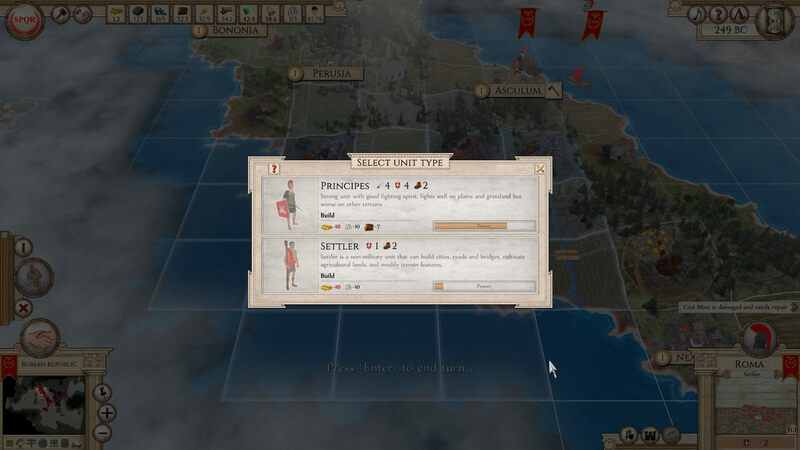 More importantly, there are three nations (the Roman Republic, Carthage and the Ptolemaic Empire) which allow you to play through the tutorial options: run simple tutorial, then if that option is picked, you can run the advanced tutorial as well. I would highly suggest picking one of the three mentioned and running both tutorials. 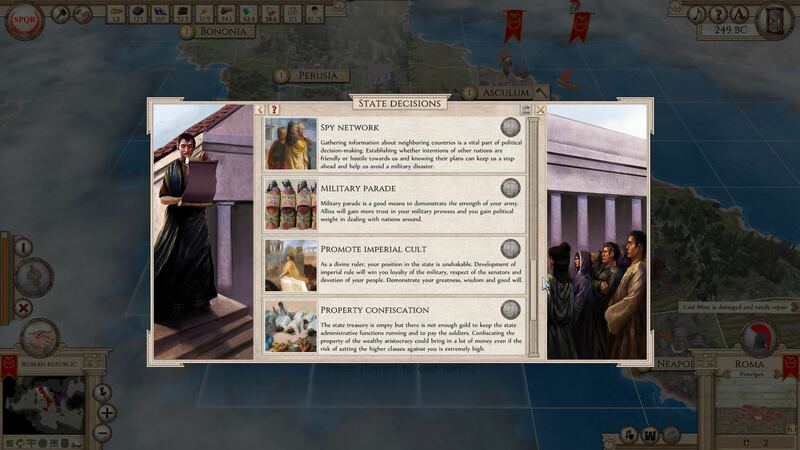 Learning options: 1) Carthage is the largest in area, has the best economy, and is the most powerful. However, there are multiple landmasses under its control. 2) the Ptolemaic Empire is second in those categories, but again, has a chunk that’s not connected to its main area. then 3) the Roman Republic is the least powerful, populated, etc. However, everything is confined, close at hand, and easy to keep up with. When you start a game, there also a bunch of options available by clicking on the button at the bottom of the screen. There are on/off toggles for army morale, loyalty, general morale, supply management, mixing the invention tree, hiding the invention tree, random events, objectives, migration, and piracy. Whew, could be a lot of decisions at once. However, when you have the tutorials turned on, most of the game options are automatically off — as you will learn the other aspects along the way. Only general morale, supply management, random events, objectives and piracy are turned on at the beginning. The rest, you’ll learn along the way. Many options to choose from, for how You want to play. Obviously, the most important part of getting rolling is your cities. 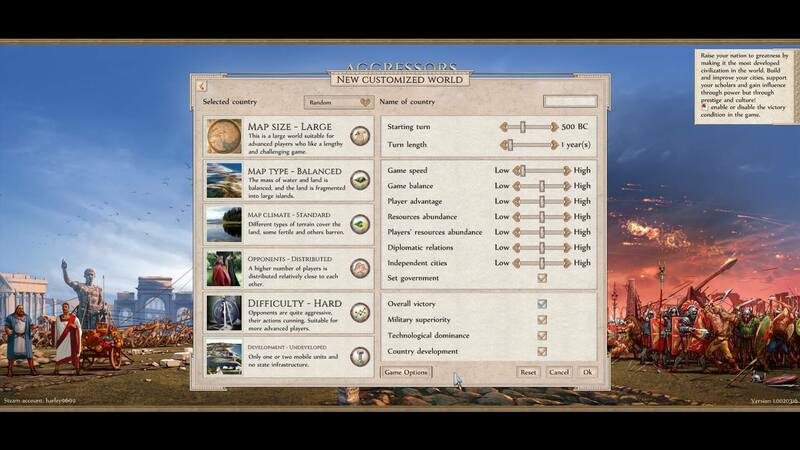 The basic start, depending on which nation you choose, gives you a capital and a few other towns. Cities are for building units (and maintaining them), plus generating money and knowledge. Depending on where they are placed, they can harvest different kinds of resources. As their size and population expand, so does the range of tiles the city controls. For example, the bigger the city, the more food and wood it produces — on the flip-side, larger cities also consume more. Infrastructure can be increased by building urban, political and/or military expansions. Also, where a city is placed affects its defensive capabilities if under attack. Again, you can improve its defense by building the right structures. Terrain affects most aspects of the entire game, as it should. Cities all have their own loyalty, influence and happiness — which can be altered by a huge number of circumstances, events, government types, nationality, etc. I warned you, there’s a ton going on internally, in the systems, all running simultaneously. One of the most intriguing and fascinating (okay, it’s just downright cool) aspects of Aggressors: Ancient Rome is the ability to place buildings outside of the cities — that affect a certain area. Placement of these is crucial to influence as many pieces as possible. For example, a blacksmith enhances any nearby mines that are within its zone; a temple influences cities, etc. Then, there are some standalone buildings for production — a stable for mounted units, a shipyard for, well, shipbuilding, etc. It’s just such a different mechanic than most games in which you’re always building things within each city. Again, I just love this facet. Before building, move around for optimum placement. When selected, it gives information in text and shows the mines affected. I’d be remiss if I didn’t mention roads right here. Obviously, they tie everything together and increase unit movement speed. The settlers that build them also build bridges over rivers. However, they also increase the output of mines and affect trading in a positive manner. Once you get into trading, you’ll see. Again, not going to be too spoilery. Quickly back to city position — you can use mountains and rivers to your defensive advantage…provided they aren’t roaded or bridged, respectively. Yes, ‘roaded’. You’re obviously going to need an army and navy to protect both your cities and (hopefully) your growing empire. Aggressors: Ancient Rome has a ton of nuances involved with their military units. Importantly, they are recruited directly from your cities’ populations. Then, there’s way more going on than simply attack and defense points. Along with a myriad of different types, there is also morale, loyalty and supply management. Your troops gain experience. They have varying attack, defense and mobility ratings. Armies have their own movement variables for terrain. Different troop types inherently fight better or worse depending upon terrain. While Roman-style units fight better on flat ground, barbarian types fight better in the forests — as well as some gaining a movement advantage as well. While each of the five ‘factions’ of armies (Roman, Greek, Carthaginian, Persian, Barbarian) has an advantage, each has disadvantages as well. Each faction has three kinds of ground and three types of cavalry units. Your troops may fight well in the desert, but be bad elsewhere. Luckily, you can look up each unit’s chart to see exactly how they do in each of the ten terrain types. Extreme detail. Right side scrolling for more terrain types. Morale depends upon their last victory or defeat, the enemy they’re against, the terrain, their supply, etc. If low enough, they can desert to the other side! They can starve while in the wrong terrain, without enough supplies. There are multiple ways they can disband. You must keep them happy, healthy and motivated. Each unit has upkeep costs you’ll have to keep track of as well. So, even if you have the population, you can’t merely crank out military units without it affecting other aspects of your regime. You must carefully plan who and when you’re going to produce — and, can you support them once they’re established? Two choices (so far) from one city alone. Tangent: Something’s that’s great for me is the ability to watch other battles between turns. You can only see where you have uncovered the fog of war (for whatever reason — trade, defensive pact, etc. and which slowly uncovers over time ), but it gives you a little insight into the ebb and flow of what other countries are doing. Unrelated, but sometimes when you click on one of your troops, they yell, “Woo!” — like they’re all excited that you chose them, they get to do something, they’re ready to fight, etc. It’s kind of funny and very cool at the same time. What do you do when you’re short of something? Well, just trade for it… or at least try to. Aggressors: Ancient Rome has an absolute monster of a trade and diplomacy mechanic. Basically, if you have a clear path to a friendly, you can trade. Of course, what the other guy proposes will be leaning toward his advantage, but the system itself is really fair…and, once again, deep. There’s the opportunity for both sides to make counter-proposals. I’ve been satisfied with every trade I’ve done. A guy has to compare mechanics to other games. C’mon, you know we all do it. Generally, trade in other games is on one side of the coin or the other. Either the AI will never propose nor accept a trade offer, or the AI is exploitable and they’ll blindly accept most things thrown their way. Fascinatingly unique to Aggressors are two other factors involved with trade: Trade Loss and Risk of Robbery. Both are dependent upon the physical length of the trade, the terrain it crosses, whether it crosses enemy territories, etc. In a nutshell, trade loss equals overhead — what it actually cost to run each route. The robbery percentage is a far worse complication. Your trade route can be intercepted by brigands or pirates. While I haven’t witnessed the former, I guarantee I have the latter. When I got a notification that pirates took fifty-three percent of my trade, on a specific route, for that turn alone!… it made me pee a little. Take both factors into consideration before signing a trade pact — obviously as well as what you consider ‘fair’ and to your benefit. Trading is only a tiny part of the complex government machine of which you’re in charge. There are eleven kinds of bilateral agreements, covering everything from map sharing, supply support and defensive pacts, to making Confederations and absorbing their entire country. There are limitless combinations you can do with trade and diplomacy. State decisions also pop up occasionally and when the right circumstances are activated. Obviously, these affect the entire country and are not to be taken lightly. As with all of the balance of Aggressors: Ancient Rome, there are pros and cons for each. Only a few of the possible State Decisions! Finally, you’ll have to complete research in order to keep up with, and hopefully surpass, the competition. Knowledge Points are generated by the city population and town size. Remember that recruiting military decreases population? You can now see a small part of that particular ripple effect — less people equals less research. Depending on your playstyle, there are a couple of great (add game-changing options) when you start a new game. In the options, research is called ‘Invention tree’. Two decisions, even before starting anew. First is ‘Invention tree mixed’ — meaning it will change from game to game. The paths to higher levels especially are more noticeable. 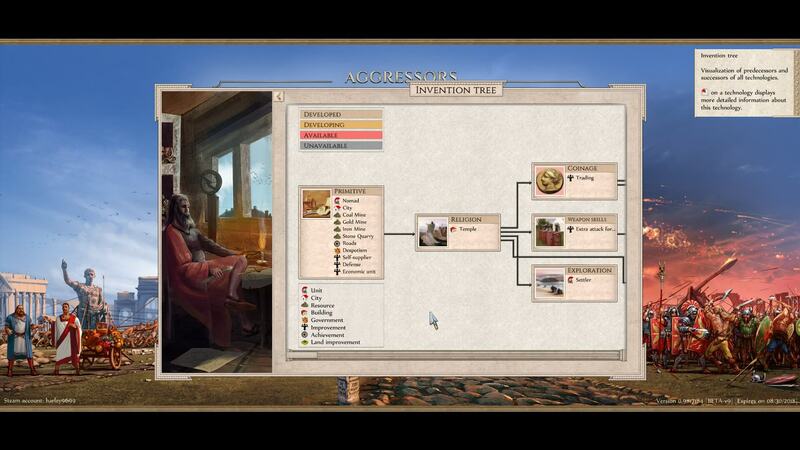 The second is ‘Invention tree hidden’ — which means you can’t plot specific course generations down the line. You really want Triremes? Leave these options unchecked and you’ll know the exact path to take to get them. However, if they’re mixed and hidden, they’ll still appear when the proper prerequisites are unlocked, you just won’t know exactly when that will occur. Hell, you won’t even know when the prerequisites will happen. That is simply one of the hundreds of options at your disposal. 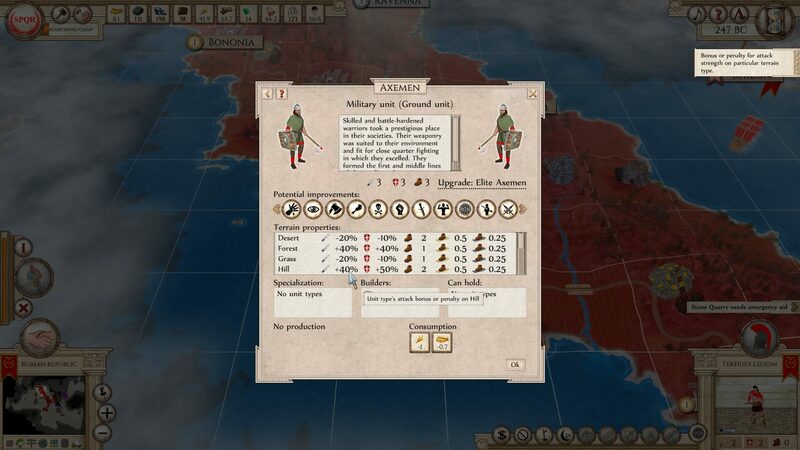 Aggressors: Ancient Rome is one of the most customizable games I have ever played. You can tinker with almost every, single aspect of the game. You set it up how you want to play it. Aggressors: Ancient Rome was difficult for me to review. Why? Because I could not. stop. playing it! Sure, it would have been easy just to take my Romans on from the tutorial and play it to the end. But nooOOOooooo (said in a perfect Steve Martin voice, from a hundred years ago – for you young whipper-snappers). I had to at least ‘start’ <coughing, due to the crazy amount of turns I ran after merely starting) both the other two campaign-enabled countries — and a lot of the other, harder nations as well. Then I got into real trouble. I started playing with the custom world setup which I recently mentioned. There’s no way to tell how many games I started and ran a ‘few’ <clears throat> turns through. What’s it do if I adjust the Opponent’s Distribution levels? How much difference is there in the different Development Levels? (hint: a lot), etc. Further tweaks are in sliders on the right side. Of course, I had to adjust those all over the place as well — then start a new game and see what they adjusted. Insane and incredible amount of customization possibilities. Needless to say, Aggressors: Ancient Rome is one that stays on the hard drive. Forever. Again, it’s very complex, but I never felt lost while learning the basics of it. I don’t know if anybody else does, but this is a historically-based game that I go to bed thinking about — then get up in the morning replaying what had happened, what I could have done differently, what my next moves should be, etc. All of that plus knowing there are probably thirty-nine thousand other little pieces I need to learn. It’s incredibly balanced and polished. I would say, ‘One more turn…”, but I know ‘one’ equals as many as I have time for. Then one more. Side note that may or may not be helpful to someone: After the tutorials (definitely) and all of those other setups I played, something that taught me a great deal was setting up a custom game while using the ‘Developed Level’ option, ‘Undeveloped’. I started on a randomized world with a Settler. Period. No city, no other units, just a lone settler. As an artist, I know what it’s like to stare at a blank canvas. I got that same feeling staring at a blank world to conquer. It taught me a lot about the Aggressors’ mechanics. F2: The most important and most used Aggressors' screen. This particular game's Victory Conditions. F3: Political Map. I'd say the second most valuable screen. Resource Usage. Click an item on the left to highlight them all. Stats for population. There are stats for everything! Strategic Overview. Click an item on the left to highlight them all. Trade Route overlay. Just one of many possible. Important one for me. You can watch your entire history like a video! Supply Limit overlay. Another of many possible. Switched to 2D. You can play the entire game this way if you choose! 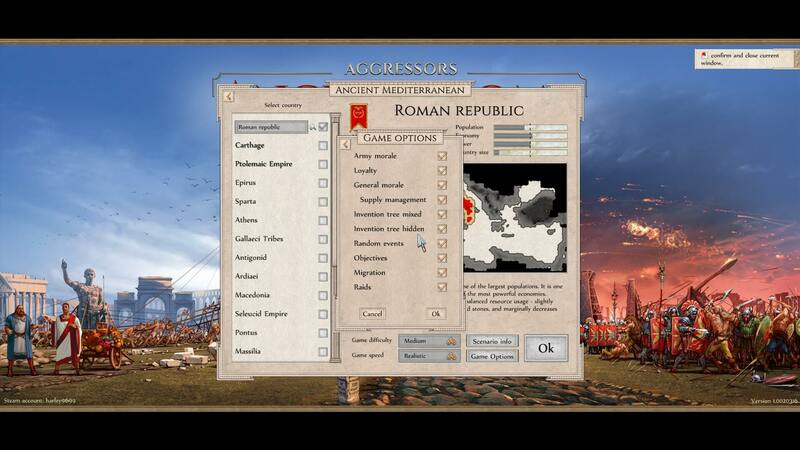 Aggressors: Ancient Rome is available now on PC. It is! I wholeheartedly agree.